There are a number off offshore islands that are easily accessible and where virgin dive sites are still being discovered. Journeys out are often brightened by encounters with dolphins and sea eagles. Closer inland is the Ream National park with sites at Koh Russel and Koh Takiev, coral is generally in good condition and untouched and marine life includes a lot of smaller fish such as anemone fish, pipefish and gobies. Further afield are the islands of Koh Rong Saloem and Koh Kron where you will see larger coral formations and larger animals including white tip sharks. 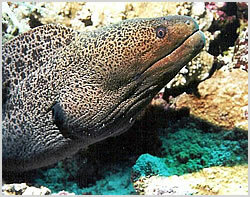 The regular reef inhabitants can also be found around these islands. Many dive spots are still being explored and charted by local operators. Way out there are even more diveable sites around Koh Tang and further that could be where the future of Cambodia's dive industry lies. Many sites are still being discovered, one called "Statues" drops down to 35 meters and has a number of submerged rock pinnacles. Its mature coral gardens are often home to bigger visiting pelagics. Sihanoukville is Cambodia's premier beach town, sporting miles of white sand beaches, picturesque islands and warm tropical waters. 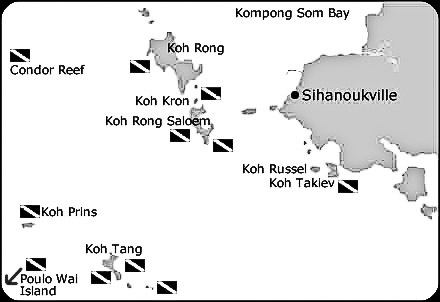 Since the coastline of Cambodia is very short and the only major settlement on it is Sihanoukville it makes sense that most of the diving operates from here. It is also the only major coastal resort in the country and the government are striving to develop it as a tourist destination.